Over/Under: Under 187.0 at 1.90 Bet Now! This is likely to be another game in the American’s march to Gold and you won’t find too many people tipping Argentina to take this game. 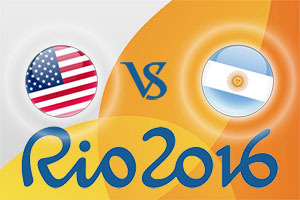 The Argentineans will always be able to look back on toppling Brazil in their home court and making it further in their tournament but unless there is a shock of seismic proportions in this game, the Americans will be lining up in the semi-final come Friday. With a 5-0 record and a points difference of +117, the American team are in confident mood and not even worrying too much about their opponent. They haven’t steamrolled the opposition in their most recent games but this may be because they were focusing on the knockout round. Yes, the Americans can’t bully some of their bigger opponents in the manner that they did to opponents at the start of the tournament, but they should still have enough in their locker. If you want to pick a potential match winner from the US side, just stick a pin into their roster and you’ll come out with a player that is worth backing! This may see the Argentineans feeling as though they are lambs to the slaughter here, but they’ll believe that they can cause an upset in this game. While Argentina finished fourth in Group B due to the head to head results, they had a better points difference than two of the teams that finished above them. They won’t fear the Americans coming into this game, although they may wish they had different opponents. This is an experienced Argentinean team, so don’t expect them to roll over. While the USA should be successful, they maybe aren’t destroying teams in the manner that they should. With this in mind, take Argentina at +22.0 which you can find at odds of 1.90. In the Over/Under market, you should look to go UNDER 187.0 which is also on offer at odds of 1.90. Bet Now! If you are looking at the Double bet market, USA half-time, USA full-time can be selected at odds of 1.11. The game starts at 2245 BST on Wednesday 17th of August.